Creating beautiful things… repurposing vintage & found items-transforming them & combining them to create beautiful new pieces. The cabinets were your basic orangey oak, laminate counters, florescent lights, linoleum flooring, an some really bad tile back splash. By the time I got to the sink area, I was pulling off the drywall in chunks. BEFORE: Plenty of darkness: dark cabinets, dark counters. Back as Iím planning to create my own blog and would love to know where you got this from or just what the theme. Lastly, and most excitingly, hwere magically making the orange cabinets disappear. Our contractor Jesse completed the addition, the woodwork on our fireplace, windows, baseboards, pillars and ceiling. It’s hard to see the cracked glass in a photo, but it really pops against some of the cabinet doors I’ve seen. SMILES: started at 3 weeks during Easter weekend when YaYa talked to her. Cabinet color is ‘White Dove’ by Benjamin Moore Paints. 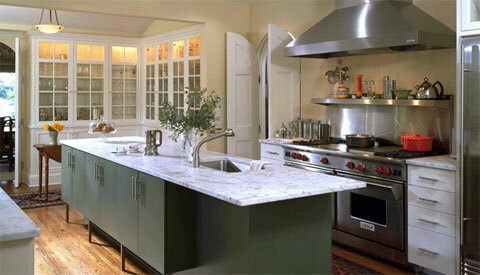 Countertops: Carrera Marble through MGS Countertops BJ is the owner and he is great to work with. The microwave worked, but it was a monster and attached as one piece to the stove. So needless to say we had an incredible heat sink that kept floor unbearable, the kitchen cold, and the whole main floor cool. Our house is 16 years old and it looks it. We have had to replace two of the appliances (got the stainless steel ones) just the stove and microwave left (in white and black). I will do the plumbing for ice-maker, dishwasher, reverse-osmosis filter and rest of the sink stuff before the SuperBowl. Off to pin – this may be my favorite kitchen remodel ever!!! It did a good job getting under the layers but it was still a pain because the scraps kept getting jammed in where the blade screwed to the bottom of the handle.